Ever wanted to let your players just hex crawl all over Hyperborea? Here are the tools you've been lacking. Customized encounter tables for every region, city, and body of water listed in the gazetteer. These suckers have it all: Monsters of every kind. Weather. Natural disasters. Human encounters from individual NPCs to pilgrims and merchants to armed patrols to rival adventuring parties. THE DREADED CELESTIAL PHENOMENA (now with new horrors like "Fortean Fall", "Voice of Doom", "Seas Turned to Blood", and "White Death"). Hundreds of different possible encounters in every region! For the most part the tables are weighted toward encounters with animals, natural phenomena, and humans - in keeping with the popular perception of what "sword & sorcery" means - but some regions are a lot more monster-ridden than others: The Aeries are crawling with mythical beasts, Sharath is thick with aliens and the undead, and if you go to Thaumagorga's Teeth, you just might meet a bunch of daemons. Keep a sharp eye out for my unique sense of "humor" too ("Tornadoes in a village always strike the lowest quality housing first." - hahaha I kill me). I know people have been asking for these, so download them today. Your players won't thank you! Time for your daily encounters! (Mostly for my own amusement, since I put so much %@! * work into this thing, but you could also use this list if you just don't feel like rolling encounters.) First up: your players are in the marshes south of Abbica's Mere. What lucky thirteen encounters will they have? It's time for daily encounters again! This time your players have foolishly made landfall on the Aeries, where a "plethora" of mythical beasts are known to dwell. Will they die by poison, blood drain, minotaur club, harpy fang, or gorgon gaze? And the winner is... griffin beak and claw! I guess the moral of this short, sad story is: don't go to the Aeries. And if you do, don't bring any horses. It's that time again - daily encounters! Today your players have traveled to Alus Mercury, the ancient Hyperborean city buried by Xathoqqua as punishment for worshiping Mercury, probably to see what loot they can grub from the ruins. What thirteen horrors await them there? Geyser – only in volcanoes, so no encounter! A bit of a grab bag of encounters. "But Xathoqqua's fury reached deeply into the bowels of Hyperborea, corrupting the other-planar energies between the Lost Continent and Old Earth. Rivulets of extra-dimensional magma now run beneath Alus Mercury, hellishly heating the city's ancient cisterns..."
Well, qualifiers like "night only" and "not in winter" are only suggestions. If a referee wants to have a blizzard in the middle of summer, that's okay with me. You never know what might happen with Xathoqqua in charge! You know what time it is: daily encounters! This fine day your players have ventured to the Anlates Isles, home of the insane buck-naked statuesque Amazon berserkers. (It's always the crazy ones...) What encounters will they have there? So it seems, at least on this visit, the Anlates Isles are less "islands of the insane buck-naked statuesque Amazon berserkers" and more "islands of the livestock". Five table entries for berserkers, and I was rolling all around them. Oh well. I guess the PCs can set up a hibachi on the beach, grill some steaks, and search for more adventurous locales tomorrow! Time once again for your daily encounters! This time your players have traveled to Atlantica, where the last remnants of the Atlantean race are slowly dying off and turning into fish. How many of those sad sacks will the PCs meet? Hunting party of 13 bowmen, led by Pelagios. They haven’t bagged any game yet. Hunting party of 16 bowmen, led by Elpis. They haven’t bagged any game yet either. Patrol of 19 light infantrymen, led by Euphemia (4th level fighter). Maybe the hunters tipped them off (if the PCs left any survivors). Hunting party of 14 bowmen, led by Galenos. These guys haven’t bagged anything either! Patrol of 13 light infantrymen, led by Heron (1st level fighter). Probably trying to catch all the Atlanteans who are wasting their time “hunting” when they should be fishing. Patrol of 13 light infantrymen, led by Lysandra (1st level fighter). I would probably make this a duplicate of one of the earlier patrols, unless the PCs have been killing them all. Atlanteans are supposed to be nearing extinction (probably because they can’t shoot straight) so there shouldn’t be that many of them running around. The hunting parties could also be the same one over and over, which would make it even funnier – the PCs keep meeting the same unlucky hunters in between stumbling over game animals. Man, the Atlanteans are lousy shots. They should really stick to fishing (and turning into fishes). What time is it now? Daily encounter time! Today your players are crossing the sinister glaciated Barrier Mountains, a bad life choice if I ever heard one. For the sake of clarity, we'll say they aren't near any of the region's volcanoes. What fearsome things will they encounter? Hunting party of 14 half-blood Pictish bowmen, led by Ch’aak. They haven’t bagged anything. Hunting party of 16 half-blood Pictish bowmen, led by Gooch and accompanied by Taan, a 7th level shaman. Perhaps because of thus propitiating the spirits, these hunters have bagged a giant weasel! Hunting party of 11 half-blood Pictish bowmen, led by X’atgu. They haven’t bagged anything yet (should have brought a shaman, guys). Poison gas – but only in a volcano, so no encounter! Geyser – only in a volcano, so no encounter! These don't necessarily need to be related to volcanic activity. The "geyser" could be a buried alien spacecraft venting steam, or maybe it's something not entirely water (green slime! ). The poisonous gas can be a "knock out" trap set by aliens/slavers/bandits/etc. Good ones! I may have to steal the green slime geyser. It's that time again: daily encounters! This time your players have ventured into the woods surrounding the Black Forest Inlet. Note: I don't recommend this. Some of Hyperborea's justly-famed naked berserkers finally put in an appearance, but only in pitifully small numbers. But the PCs shouldn't become too complacent. That 4d10 has to come up sooner or later! Nasty, but it could have been much worse - there are liches on the table. Daily encounter time! Today your players are crossing the shifting sands of the Black Waste. What thirteen awful things will they meet? Sand pit – 60’ deep! So the moral of this tale is: if you must cross the Black Waste, do it in one day and not during summer. Good luck! Time for daily encounters! Now your players have entered the forests of Brigand's Bay, where every two-copper thug is a king. How many "kings" will they meet? Patrol of 18 medium infantrymen led by Rhul (8th level fighter). These are soi-disant nobles looking for trouble, as soi-disant nobles are wont to do. Hunting party of 13 bowmen, led by Rammdailia. They have brought down a couple of aurochs (I rolled 18, but let’s not get ridiculous) and are bringing the carcasses back to their bandit keep on poles for a feast. Patrol of 15 light infantrymen, led by Garr (11th level fighter!) and accompanied by Penn (2nd level magician – hahaha I rolled a magician named “Penn”). More “nobles”, but at least the leader has the levels to back it up. Duntanna, 8th level druid accompanied by 16 aurochs (not as good as tigers maybe, but what can you do?) Hey, I think these might be the aurochs those hunters tried and failed to kill! Did Duntanna save them? A chance for the PCs to gain an ally against the “nobles”, maybe? It's time once again for your daily encounters! This time your PCs are at sea off the treacherous, icy Broken Coast. What will they meet there? 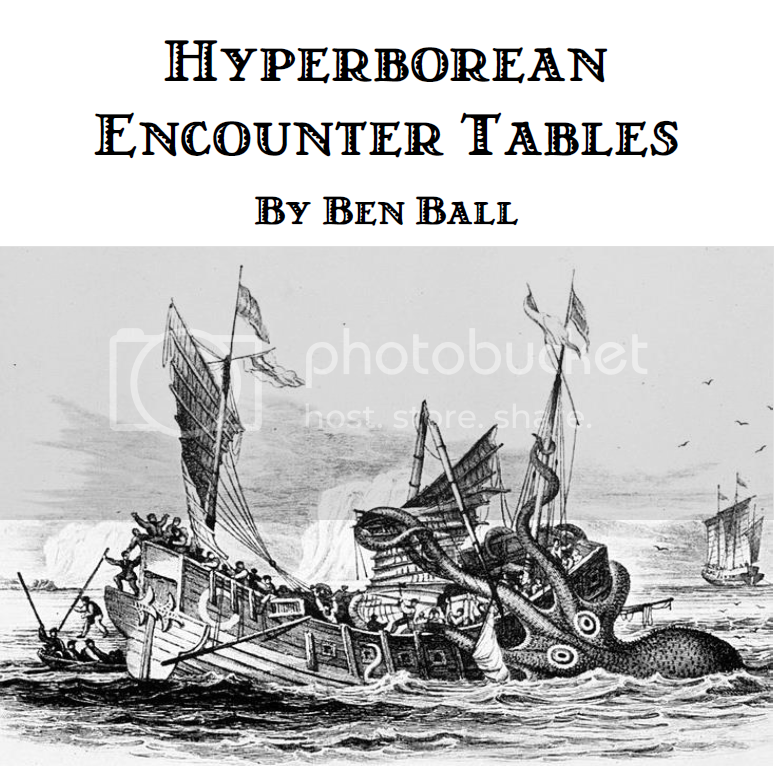 A gloomy set of encounters, as befits a gloomy region of Hyperborea. Daily encounter time! Today your players are exploring the forests of Cape Calencia. Hopefully they'll meet the "hospitable" half-blood Picts, and not the countless savage ape-men living thereabouts. 600 bats – night only! Yikes! I guess if wishes are horses, beggars are walking today. It seems strange to have crocodiles in an "icy" region, as they are typically only found in tropical latitudes. But then again, it is Hyperborea, so maybe they're mutant white crocodiles. The manual does say they're mostly found near the rim of the world, but there was a limit to how complicated I was willing to make these tables. If I wanted to explain why they're in an icy region like the Broken Coast, I would probably say hot springs. Or maybe they are mutants. Now I want to make some sewer tables just so I can put crocodiles in them. What time is it? Daily encounter time! In this episode, your players have ventured by airship to the City in the Clouds, an Amazon enclave that is just sort of floating near Hyperborea. What will they meet there? "Lots of Amazons" is what the PCs met (some maybe with ray guns). I hope they like strong women! It's that time again: daily encounters! This time your players have traveled to the Crab Archipelago, where human crab-kin slavishly obey the dictates of crab-men from outer space. Will their alien masters put in an appearance? Hunting party of 12 crab-kin bowmen and 13 dogs, led by Huctia. They are toting the corpses of 6 wolves (food or pest control – you decide). I forgot to roll dogs for all the hunting parties prior to this one – no wonder they couldn’t bag any game! Hunting party of 13 crab-kin bowmen and 12 dogs, led by Arviragos. They haven’t had any luck (I guess dogs are no panacea after all). War party of 39 crab-kin bowmen led by Barita. Their arrows have been treated with class II penetrative poison! Hunting party of 11 crab-kin bowmen and 7 dogs, led by Caratacos. They haven’t had any luck either – a herd of 90 deer must be tough to find on an island. 80 Chaotic Evil pilgrims, led by Sammpenna (2nd level priestess), who is assisted by 1st level priests Raidalla, Rhulrana, and Penn the Lesser. In addition, there are three warlocks with the group: Fellxell (10th level! ), Zonn (1st level), and Penn the Greater (5th level). These are Kthulhu cultists, trying to sneak in and visit a sacred squid-god shrine under the very noses of the crab-men. If this encounter goes south, the PCs are in hot water. But maybe they can set the pilgrims and crab-kin at each other’s throats? Hunting party of 11 crab-kin bowmen and 4 dogs, led by Verica. All they’ve managed to bag is a lousy falcon. Hunting party of 13 crab-kin bowmen and 15 dogs, led by Arviragos. (Hey, I think they met these guys already!) The crab-kin still haven’t managed to bag any of the deer or horses swarming the island. No alien overlords on this trip. But there's always tomorrow! Time for daily encounters! Today your players have made the dubious decision to journey to Dagon's Bay, where the inbred inhabitants are also suspected of being "outbred" (to abominable ichthyoid monstrosities). How many times will the unfortunate phrase "Squeal like a pig!" be needed? Hunting party of 13 bowmen and 13 dogs, led by Illotroi. These goggle-eyed degenerates haven’t bagged any game. Hunting party of 13 bowmenn and 12 dogs, led by Phaleor. These scabrous mongrels haven’t bagged any of the (clearly plentiful) game either. It's not even a nice place to visit! Ha ha yeah, I would have liked to have rolled some fish-men (particularly the 2d4x10 result). It's time once again for daily encounters! In this episode, your players have boldly ventured into Death Valley, the frozen rift which is said to open into Underborea itself. Will they meet any daemons there? No daemons, but 22 abominable snow-men has "TPK" written all over it. Yeesh. Once again, it's time for daily encounters! This time your players have traveled to the shifting sands of the Diamond Desert, no doubt in search of the eponymous diamonds (green or otherwise). What horrors will they meet there? Nice! I'm a little annoyed that I've yet to roll a gorgon, even in the Aeries. It's that time again: daily encounters! In this edition, your players have arrived in the Keltic village of Dunwich, a very friendly place (compared to the last several, that is). What trouble will they get into nonetheless? I think I can guess why Saraid the Surly is so surly. How deep is Saraid the Soft's voice? Good morning and welcome to daily encounters! Today your players have made port in the Viking capital of Erikssgard, where the men are men and the women are off-limits. Who or what will the PCs meet there? Patrol of 17 light infantrymen led by Ullmundr. Patrol of 17 light infantrymen led by Hildr. Sandstorm – but Erikssgard isn’t in a desert, so no encounter! Patrol of 13 light infantrymen led by Hrafn. Looking for the notorious Arnstein. Patrol of 10 light infantrymen led by Oddny. Also looking for the notorious Arnstein. Heat wave – only in a desert, so no encounter! Ullhildr (7th level priestess of Ymir) and her 3rd level assistants Little Gunnhildr, Frida, and Gunnhildr the Red. In 5 rounds, they can summon a lynch mob of 16 concerned citizens. Give me a 'D'! Give me an 'A'! Give me an 'I'! Give me - I'm not going to spell the whole thing. In this episode, your players have journeyed to the grassy shores of Esquimaux Bay, where the natives are hardly evil Kthulhu-worshippers at all. What will the PCs encounters there? Hunting party of 15 bowmen and 10 dogs, led by Karpok. They haven’t bagged any game yet. Hunting party of 13 bowmen and 12 dogs, led by Karpok (the same party, minus a couple of casualties and plus a couple of dogs?) They haven’t managed to bag any of the plentiful game. So the answer was: a lot of red deer and some inept hunters (who barely even cavort by night in honor of the squid-god). Onward to more fantastical areas! They were beset by another small group of Crab-men-worshiping Esquimaux "hunters" (most likely looking for sacrifices or slaves). They lost a couple of men and a few dogs, but they decimated they're attackers and commandeered the other party's dogs (and sleds). All the war-cries, barking, and gurgling blood scared off the deer. Good one! I'm sure it happened exactly that way. Daily encounter time! Now your players have made the probably unwise decision to travel to the Ixian capital of Fazuum, City of the Snake-Worshiping Necromancer-Slavers. Just how much trouble will they find there? 90 shackled slaves guarded by 8 light infantrymen, whose leader is Phoros (10th level fighter!). Are any of the PCs Spartakos? Lustaiyon, 12th level (!) Neutral warlock, accompanied by 5th level apprentice Ganos and 7 5th level heavy infantrymen. Will this wrecking crew be friend or foe to the PCs? Xathoqqua's ears! More like "City of the High-Level NPCs". Must be University of IX alumni.